EU Referendum: Sacre Bleu! Eees climate change! Sacre Bleu! Eees climate change! 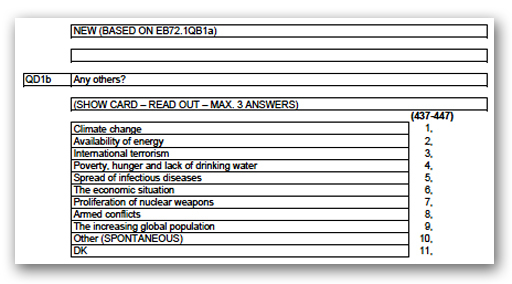 Sir, I am from Eurobarometer and would like to ask you some questions about climate change. 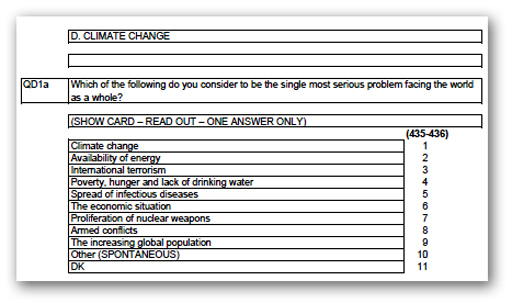 Do you agree to answer some questions about climate change? You do? Good. Now, please look at this card headed "climate change" (above) while I read out a list. Give me one answer only - which of the following do you consider to be the single most serious problem facing the world as a whole? Mais alors. Sacre Bleu! We find that the majority of the public in the European Union consider global warming to be one of the world's most serious problems, with one-fifth saying it is the single most serious problem. On top of their game? Still think you would win? Can we leave the EU?